The countdown for Wings of Glory Miniature Game – Giants of the Sky, the new Kickstarter project from Ares Games, has started: in one week, on March 10th, Ares Games will launch the crowdfunding campaign to release the large WW1 bombers Handley-Page O/400 and Zeppelin Staaken R.VI. The campaign will run until April 2nd, with an initial funding goal of $20,000. Handley-Page O/400 with a Fokker Dr.I for size comparison. The two models are interesting from every point of view - historical, visual, and gameplay. 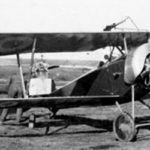 The British Handley Page O/400 was a huge Entente bomber used to support ground troops on the Western Front and fly bombing raids deep into enemy territory. The German Zeppelin Staaken R.VI was the largest airplane ever to fight during World War 1, with a wingspan rivaling a World War 2 Superfortress. 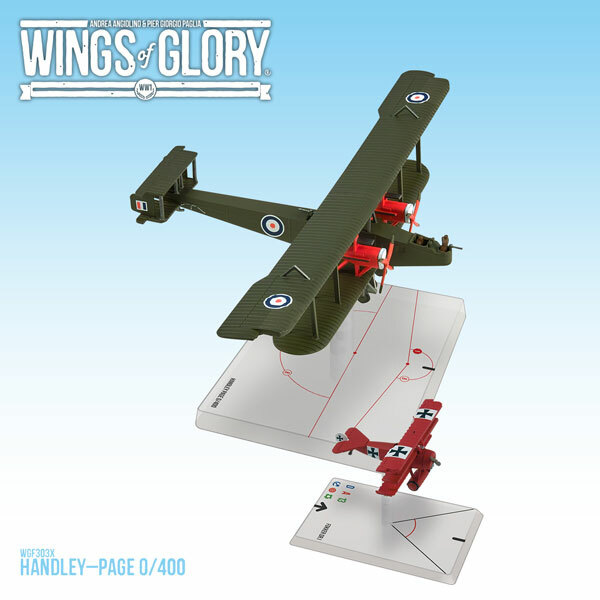 Each of these colossal airplanes will be featured in Wings of Glory in two different versions. The Giants of the Sky Kickstarter project will have eight pledge levels. The first one is the Rookie Level, targeted for new players. It includes everything needed to start playing Wings of Glory: the WW1 Rules and Accessories Pack and a selection of four of the best models available in the game range (the Fokker Dr.I, Albatros D.V, Sopwith Camel, and Spad XIII). Newcomers can combine the Rookie with the Entente or Central Powers Players pledge levels, also getting one of the new big bombers. The Entente Player pledge level includes one 1/144 Handley Page O/400 and the Central Powers Player level, one Zeppelin Staaken R.VI. Both are painted and assembled miniatures, complete with special gaming base, maneuver deck, airplane card, management card, counters and rules. For people wanting both of the new bombers, the Veteran pledge level comprises one Handley-Page O/400 and one Staaken R.VI, while the Collector pledge level offers four models - both bombers in their two versions. For Veteran and Collector levels, there will be "Day One" Early Bird pledges available for 24 hours after the launch of the project, offering a small additional discount as a “thank you” to the initial supporters. Zeppelin Staaken R.VI with the Fokker Dr.I. There will be also an exclusive pledge level for Retailers, which grants special pricing for hobby games retailers. This pledge level offers twelve 1/144 Zeppelin Staaken R.VI and twelve 1/144 Handley Page O/400 miniatures (six of each versions for both models), as well access to all the stretch goals of regular backers. The rewards for Rookie Pledge Level will ship immediately after the end of the Kickstarter, while the new bombers are expected to deliver in October, 2015. The rewards of this Kickstarter project will not include exclusive miniatures, as these models will become a permanent part of the game, and any player must be able to purchase them through normal distribution after the Kickstarter delivery. To thank the backers, the Kickstarter version of these airplanes will have unique packaging, different from the normal edition, with a "Limited Edition" certificate with each plane. Depending on the success of the project, one or more additional items may be included in this version. 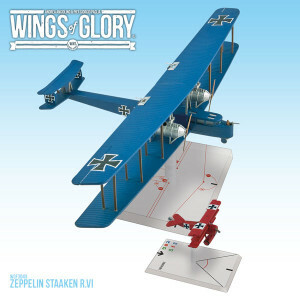 A number of stretch goals to enhance the gameplay experience are planned for the campaign, including special mission and game mats related to the models presented; accessories such as deluxe laser-cut rulers and acrylic counters, developed by our partners at Wings of Glory Aerodrome; and more. 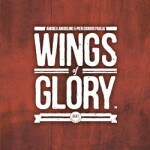 The Wings of Glory Miniature Game – Giants of the Sky will be launched on March 10th and will run until April 2nd. Get ready to take off!